The iPhone X is more than just a yearly upgrade for Apple, it’s the biggest overhaul its famous smartphone range has seen in years. As such, it’s a very different phone to the iPhone 7 – itself a flagship handset which still impresses despite now being a year old. But not everything has changed, and not all of the changes will necessarily be for the better, depending on what you want from a phone. So we’ve created this article to guide you through what’s new and what’s not. Covering everything from the design and screen, to the camera, power and beyond. The iPhone X has a brand-new design, sporting a glass back and a metal frame in place of the metal unibody of the iPhone 7. The iPhone X is also far bigger than Apple’s previous handset, coming in at 143.6 x 70.9 x 7.7mm, while the iPhone 7 is just 138.3 x 67.1 x 7.1mm. But while the iPhone X is bigger, the gulf isn’t as much as you might expect, thanks to the almost complete absence of any bezel on the front. In fact, the front is so screen-filled that Apple has even removed the home button. And while that glass back might be cause for concern if you’re clumsy, the iPhone X should at least fare as well in water as the iPhone 7, as both phones are IP67 certified dust and water resistant, meaning you can submerge them up to 1 meter deep for up to 30 minutes. Another difference comes in the form of the colors you can buy each phone in, though there are a lot of identical shades. The iPhone X is launching in Space Grey and Silver, while the iPhone 7 is available in Jet Black, Black, Silver, Gold, Rose Gold and Red. If the design was a big change, the screen is perhaps an even bigger one, and big is the key word, as the iPhone X has a 5.8-inch display, while the iPhone 7 has just a 4.7-inch one. The display technology differs too, with the iPhone X using AMOLED, which can lead to improved contrast and more vibrant colors than the IPS LCD used by the iPhone 7. There’s also almost no bezel around the iPhone X’s screen, while the iPhone 7 has large bars above and below, and of course the iPhone X is higher resolution, coming in at 2436 x 1125 and 458 pixels per inch, while the iPhone 7 is just 750 x 1,334, though its small size means it’s still a crisp 326 pixels per inch. Apple’s ditched the home button from the iPhone X to have an all-screen front, but in its place there are gesture controls, letting you swipe to navigate. And the iPhone X also supports HDR and has a True Tone display, letting it automatically adjust the white balance depending on your environment, which the iPhone 7 can't. However, both phones benefit from 3D Touch – that handy feature that lets the display recognize different levels of pressure when you’re tapping it, and respond in different ways. The iPhone X was always going to get a power boost, and specifically it’s got a new A11 Bionic chipset, which is a six-core one. The iPhone 7 meanwhile is powered by a quad-core A10 Fusion chipset and Apple claims the X's two fastest cores are 25% faster than the A10 Fusion, while its GPU is 30% faster. There's a difference in the RAM amounts too, with the iPhone 7 rocking 2GB, while the iPhone X is believed to come with 3GB. The iPhone X also has more storage at both the bottom end, starting at 64GB and rising to 256GB, while the iPhone 7 starts at 32GB and rises to 256GB, with a 128GB size in the middle. Don’t expect much of an operating system difference though. The iPhone X runs iOS 11 and while the iPhone 7 was on iOS 10 you should soon be able to update it to the new version. Note however that Apple is bound to support the iPhone X with software updates for longer than the iPhone 7. Both the iPhone X and iPhone 7 have a 12MP camera, but in the iPhone X’s case it’s a dual-lens one. That allows for optical zoom and bokeh effects (blurring the background of a photo), and the camera also benefits from optical image stabilization on both lenses, as well as augmented reality (AR) features. The iPhone 7 has none of this, other than optical image stabilization on its single lens, but it’s a camera we were very impressed by in our review, noting that it even performs well in low light. 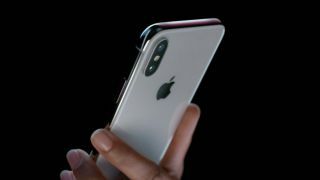 The iPhone X also has upgraded video skills, as it can shoot 4K video at 60fps and 1080p slo-mo video at 240fps, while the iPhone 7 can only manage 30fps for 4K video and 120fps for 1080p. Around the front there’s a 7MP camera on both phones, but the iPhone X’s has a very clever new trick, namely the ability to identify you and unlock the handset by scanning your face. Apple hasn’t revealed how big the battery is in the iPhone 8, but rumors suggest it has a 2,716mAh one, and in any case Apple has said that it should last for 2 hours longer than the iPhone 7's. The iPhone 7 on the other hand has a 1,960mAh battery, which struggles to last more than a day in our tests. We’ll let you know exactly how the iPhone X fares in our full review, but this is one area we really hope to see improvements from. At the very least though the iPhone X shows improvements when it comes to charging, as you can do so wirelessly, whereas the iPhone 7 has to be plugged in. The iPhone 7 is a fairly expensive phone, starting at $549/£549/AU$849, but the iPhone X is far pricier, with a starting price of $999/£999/AU$1,579. The iPhone X could be the phone many Apple fans have been waiting for, thanks to a new design, a big edge-to-edge screen, a dual-lens camera, lots of power and new features, such as a face scanner. But the more compact iPhone 7 is sure to still have its fans, especially as it's a lot less expensive, and still a very powerful and stylish phone. But if you’ve been craving something truly different – or just something bigger – from Apple then the iPhone X could be the phone for you, just as long as it lives up to its promise. We’ll let you know whether it does once we’ve put it through a full review.